The 11th Asian-Pacific City Summit was held in Kumamoto, Japan from October 31 to November 2, 2013. The report is now available for you to download! You can download the presentation data of the 11th Asian-Pacific City Summit, which was held in Kumamoto City, Japan from October 31 to November 2, 2013. Keynote Speech "UN-Habitat & Making a Livable City"
Fukui: "Making A Place You'll Want to Call Home"
Ulsan: "Ecopolis Ulsan Past, Present and Future"
Aix-En-Provence: "A village of international standing Aix-En-Provence"
Hai Duong: "Initiatives for developing a livable city"
Heidelberg: "'Knowledge Creates the City' How Cities Can Use their Scientific Assets for the Future"
Singapore: "'Liveable City Development': The CLC Liveability Framework"
Hong Kong: "Plnning for Liveability in Hong Kong"
Auckland: "AUCKLAND on the move - Our transition to transformation"
Busan: "'Building a Better City to Live in' Visions and Development Projects of Busan"
Fukuoka: "Harmony among People, the Environment, and Urban Vitality"
Pohang: "Pohang, Where Nature and People Coexist"
Kumamoto: "Kumamoto, A Castle Town Flowing with Natural Spring Water"
Gwangyang: "A sustainable eco-friendly city construction"
Kagoshima: "Healthy, Secure, and Safe Town: Sakurajima Volcano Disaster Prevention Plan - Kagoshima City's Approach -"
Oita: "Oita: The city where citizens can live healthy and comfortably - Looking at our city 30 years from now -"
Nagasaki: "Creating a Town That's Easy to Live In - Creating a Town That is Enjoyable on Foot -"
Vladivostok: "Initiatives for the Livable City Development The City of Vladivostok: Sharing Success and Perspective"
Kitakyushu: "Kitakyushu's Growth Strategy for City Planning that Promotes Comfortable Living"
Bangkok: "Bangkok Initiatives for Livable City"
The 10th Asian-Pacific City Summit was held in Pohang, Korea from July 26-28, 2012. The report is now available for you to download! 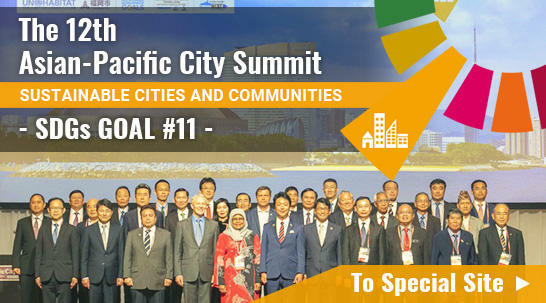 You can download the related data of the 10th Asian-Pacific City Summit. Ipoh Presentation: "Rainwater harvesting system in Ipoh City"
Jeju Presentation: "Development of Circular Eco-trail System"
Kitakyushu Presentation: "Urban Policy and Inter-city Cooperation for Low-Carbon Green Growth"
Fukuoka Presentation: "Fukuoka City's Approaches Toward Becoming a Green City"
Jakarta Presentation: "Green Growth Development based on Low Carbon City in Jakarta"
Gwangyang Presentation: "Building a City of Low Carbon & Green Growth"
Kumamoto Presentation: "Moving towards a Low-carbon Kumamoto City"
Oita Presentation: "Measures to Create a Low Carbon Society in Oita City, Japan"
Vladivostok Presentation: "Vladivostok's Major Environmental Projects"
Kagoshima Presentation: "Low-Carbon Policies in Kagoshima City"
Pohang Presentation: "Downtown Revitalization Strategies of Pohang"
[Special Session] Miyazaki Presentation: "Reconstruction after Foot-and-Mouth Disease"
[Special Session] Bangkok Presentation: "Bangkok Flood Protection System"